We spent the day yesterday at Cedar Point. My Dad watched the boys for us and we took DD and one of DH friends and spent the whole day at the park (10am-10pm). we had a blast! Anja went on almost all the rides excluding Top Thrill Dragster and about 2 others. We hit Millennium Force 1st and she said it was "awesome" which came after she exclaimed "oh crap!" when we took the 1st dive on the 1st hill. I let her have that one. 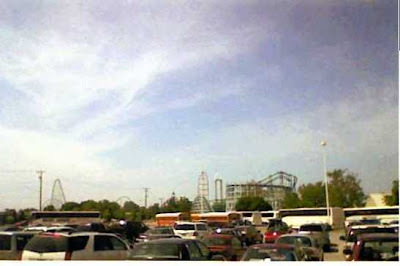 She took this photo from the parking lot on her DSi so the quality isn't great but this is a shot of the park. The coaster on the left by the pole is Millennium Force. The one in the middle that looks like there are bars going accrss it as it shoots straight up is Top Thrill Dragster (which goes 0-120mph in a matter of seconds!). We had fun, we got burned and I am thourly sore... it was a good day and very worth it! Weather was great! started out overcast then cleared up. I enjoy seeing your lovlies, especially the doily in the hoop. Gorgeous!! thanks, I had never thought of puting a doily in a hoop before, might have to work on that idea with other doilies! And roller coasters deffinatly arn't for everyone! I was suprised. I got sick the last time I went to our free fair festival but was fine at the park. I think it's the round and round rides i have a problem with. They are pretty impressive/intimidating the way they tower over the tree tops though.